GOP Students' Race-Based Bake Sale Sparks Controversy At Berkeley : The Two-Way The young Republicans are protesting affirmative action legislation by charging whites more than others. Others on campus say they're being offensive. Republican students at the University of California, Berkeley, say they're being satirical. The school's student senate says they're being discriminatory and others on campus say they're being offensive. 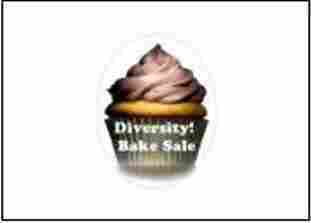 -- White/Caucasian students, $2 for each baked good. -- Native Americans, 25 cents. And, they're taking 25 cents off for women. The prices are different, according to the Republican students, "to ensure the fairest distribution." And on the Facebook page about the event, they ended by saying: "Hope to see you all there! If you don't come, you're a racist!" Salih Muhammad, chair of the campus Black Student Union, tells the student-run Daily Californian that "we're not open to being reduced to a price at a bake sale. ... There's a certain point where satire becomes disrespectful." But the whole point of the bake sale is to highlight discrimination, the treasurer of the Republican student group says. "People are being judged by their skin color (in affirmative action policies)," Francisco Loayza IV said at a meeting of the student senate on Sunday, according to the San Francisco Chronicle. "I don't want to be judged because I'm brown. Look past the prices, and see what we're trying to do." The student senate vote 19-0 to condemn "the use of discriminiation whether it is in satire or in seriousness by any student group."